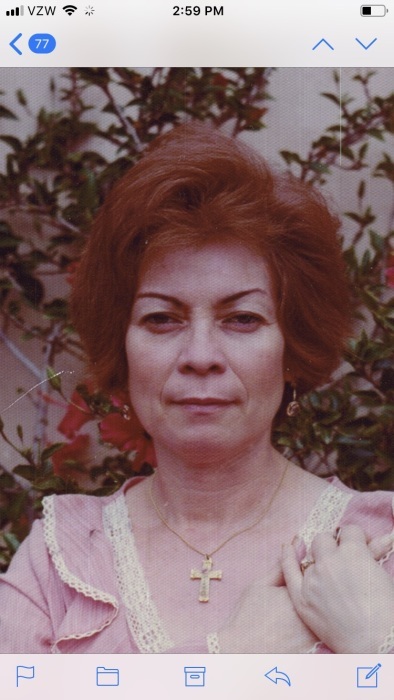 Elvira Ploneda, 86, passed away peacefully on Tuesday, February 6th at her home, surrounded by her loving family. Mrs. Ploneda was a resident of San Diego for 55 years. Mrs. Ploneda was born on January 25, 1933 in Colilma, Mexico, the daughter of Jesus Cardenas and Silvina Barragan. As young adult, she was one of the first telephone operators in Colima when phones were first being established in the city. Mrs. Ploneda married Francisco Ploneda on February 14, 1952 in Colima at San Francisco Cathedral. Mrs. Ploneda enjoyed her time as an Avon representative in which she was greatly successful since she had such a cheerful spirit she always had many clients. She also served as a volunteer for Paradise Valley Hospital and at St. Jude’s Senior Center Beauty Salon. Mrs. Ploneda was active in the senior community participating in speed walking marathons and performing in a senior instrumental band. You would be guaranteed a soulful laugh from her if she was watching her favorite show“I Love Lucy.” When her grandchildren visited she enjoyed sharing her favorite treats which were Sees candies. Mrs. Ploneda had a wonderful, welcoming personality with a warm heart and her smile would light up the room. Her spirituality and prayer brought her tranquility and confidence to overcome any of life’s hurdles. She gave us life and helped shape our personalities and can be credited for our many accomplishments. We were all fortunate to have been able to call her Mom (and Grandma). Survivors include her four sons Francisco, Oscar, Jesus and Moises and three daughters Elvira Huezo, Silvana Perrila and Carmen Hunter. She has nineteen grandchildren; twenty-eight great grandchildren and five great-great grandchildren.